Three gentlemen went into another discussion a while back. This time on the festivals they went to (or not) quite some time ago. With the festival season having started this month, it seems an appropriate time to post. Have you got the album? I was thinking of getting it for the Rory Gallagher, Faces and Piledriver-era Status Quo tracks but never got round to it - but will get it one day I expect. went to I think was in Holland, Wout, in 1974 ....or thereabouts.......everybody was stoned..... and I can't remember the name of it..... or even who was headlining. No, surprisingly I never got the album, but if I see it at a record fare I will probably buy it! I do agree with you about listening to music at home, however when Was in my teens through my twenties, it just had to be done! It is most certainly not something I would contemplate at the grand old age of 61! Although I came close to going to see ELP at the High Voltage Festival ten years back. Also some of my friends go to the Ramblin' Man Festival in Maidstone, so I may do that at some point dependant on lineup? http://www.ramblinmanfair.com . Funnily enough I was at the Hop Farm last night at a meeting! Sadly the company that runs the Hop Farm festival wen’t bust a few years ago…. I think Prince was the last artist there? I am trying to remember my first festival, but am just not sure. So I turned to Google. May 1984 was my first. 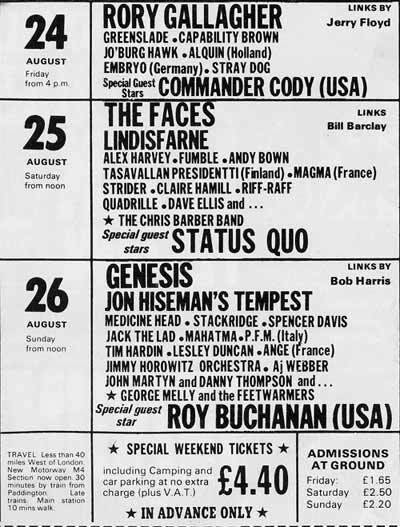 In the early to mid 80s there was a twice yearly live broadcast festival on German television called Rockpalast, staged in the Grugahalle in Essen. Three bands played deep into the night. On one of those nights my friends and I saw Jack Bruce and Friends play and were so impressed. I bought the album straight away, an album I can't really listen to any more I'm afraid. At the time it was fantastic though. Then we found out he would play the Lochem Festival. So we got ourselves tickets, drove to the eastern part of the country in my Mitsubishi Galant and saw him play a great show. I remember Bo Diddley playing as well, not really liking it, because every single song sounded the same and Mink Deville, who was quite alright at the time. I also still like to convince myself that the beautiful redhead sitting in front of us was the star from the Golden Earring video 'When The Lady Smiles'. We didn't dare to ask, shy youngsters as we were. 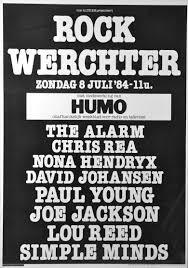 The reason I wasn't sure which festival came first, was that I also went to the Werchter part of the then touring festival Torhout-Werchter that year (8 July). Now a four day festival just in Werchter. The same friends went to see Lou Reed play. 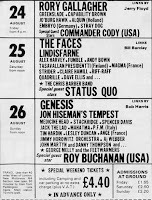 I remember the Simple Minds playing also before Reed, who was supposed to headline, but only managed to play the field empty. Chagrined, sour and extremely monotonous and hampered by bass amp problems. Someone cancelled at the last moment. I can't remember who, but I can't remember having seen Joe Jackson play, another one of my great favourites at the time. I still have a, now severely undersized t-shirt from the 'Body & Soul' tour of 1983. So it may have been him. The replacement was John Hiatt, I'd say, who I had just learned about thanks to a live broadcast I taped fairly recently before this show. David Johansen was quite the showman, I remember. His music was so so. I have never been a great fan of festivals and have never been to a several days one. Through the years I kept going to one day ones. Here in Haarlem there is the Bevrijdingspop each year on liberation day. Something I have been going to for several years now. And yes, I like to move in public when appropriate. Shows in smaller venues have my preference nowadays, which culminated in the living room concerts my girlfriend and I stage since last year. Magical experiences they are. Five weeks from now the next one takes place. If it wasn't such a long way to travel, I'd say come on over. Thanks Wout, I am sorely tempted to come! But as you say, its a little way to travel and I have family commitments…. Is it 'bring a bottle’ 😉? 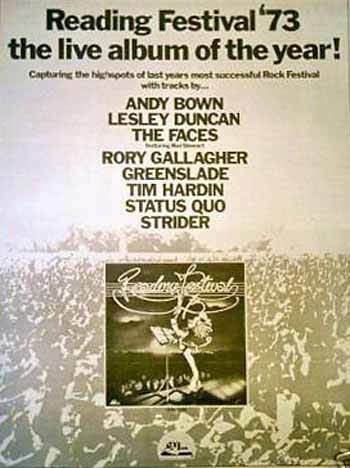 Yes, the first wave of music festivals started to lose their magic in the late 70s with a few exceptions, there were not many I liked the look of during the following decades… of course Live Aid in ’85 was a major exception, followed by the amazing growth of Glastonbury. 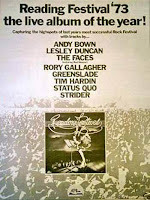 The early 70s music festival years in the UK were a phenomenon that we will probably never see the like of again?